The tragic thing is that if anyone does fix up that limo, they probably will make a fortune using it ... hiring wacky groups of lads shouting "Rodney you plonker" out the window. Ã‚Â£10600 with nearly nine days to go I think that's the Top Gear effect. In 1998 one of those sold for Ã‚Â£35000! It isn't the Top GEar effect - they were always expensive! The going rate is still Ã‚Â£30-50k! it is the world's smallest production car, hence the big bucks! Seeing a bloke driving along in a sliding door van, door open, no seatbelt, fag on and probably wearing a flat cap, was about as impressive as it got. This guy has had these things on eBay at least 5 times over the last couple of years. I think he wanted about Ã‚Â£2000 which is why he's still got em. Jeez, that Only Fools and Horses limo is without doubt the biggest pice of sh*t I have ever seen. Why the continuing fascination with this programme? Sure it was funny (in 1987) but come on, let it go. I preferred "Allo Allo" but that doesnt mean I want to buy a Traction Avant and paint pictures of Gordon Kaye or Vikki Michelle on it.Local bloke has got a Chrysler PT with load of Star Wars artwork on it. He calls it the "Jedi Cruiser" and I just have to try and get down a pic of it. Possibly the only way to make something awful even worse! Yup, thats the one! Where'd you find that? /\/\/\ Mil, I can't find the listing for this hideous thing, can you post it up so we can laugh at it please? I hope to god it doesnt belong to one of us! 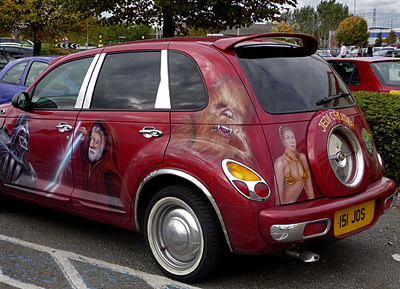 Sorry, it's not a listing I just tapped 'Jedi Cruiser' into Google image search. I was so intrigued by Parky's description. I have seen it at my kids school so possibly one of the parents or grandparents. Occasionally see it pottering about South Essex but havent caught sight of the owner. Perhaps they have a bag on their head to avoid being recognised?I'm not a vain person but if I had been hitchhiking in the cold and rain for 12 hours and that pulled up, I'd seriously have to ask myself if I wouldnt be better off waiting for someone else!Despite all that, the airbrushing isnt half bad but I still cant help but ask why. Can you imagine the salesmans face if you tried to PX that thing? "I've got a bad feeling about this" never rang truer. Are there any un-scened passats of this shape left in the UK? What a big POS. Whats with the roofrack anyway? I can sort of 'get' somebody putting an old Cola chiller or branded fuel can on the roof but that looks like someone has emptied the contents of a skip onto it. I had a Passat of that shape about 15 years ago, but it was a hatchback instead of the estate. It went alright, boring to drive but economical and never put a foot wrong. "I need passage to Aldershot..."
He even posted my helpful reply. I think that's my 'uber shite' mobile, I'd love that, but I'd never pay Ã‚Â£1k for it though. Now that to me is living the dream, Especially if the van was a Sherpa! Has now been advertising it on Retro Rides, he wants Ã‚Â£895 ono for it, It was up for Ã‚Â£1295 a little while back, It sounds pretty cheap and I'd quite fancy it myself but i have no room, Is it of interest to anyone on here? I bought a Y reg 2.6 SE back in the late '80s. Never again.If it was a proper one with a proper engine, I'd be all over it like a rash. Why are the 2.6's so unliked then?, I don't know much about them so I'm interested to know.Are they less reliable then the V8's? I bought a Y reg 2.6 SE back in the late '80s. Never again. If it was a proper one with a proper engine, I'd be all over it like a rash. V8's sound immense. Hair on the back of your neck kind of thing. The 2.6's sound toss. That is all.